(Katie Pach/Daily Senior Staffer) Parent volunteers from the Latino Advisory Committee at the Evanston Township High School District 202 board meeting. They gathered to show their gratitude to the board for passing the “safe haven” resolution. With the impending inauguration of Donald Trump, Evanston Township High School District 202 board voted unanimously on Tuesday to declare ETHS a “safe haven” for students and families subject to any changes in immigration policy. The resolution holds that the school will not actively investigate a person’s immigration status unless required specifically by a court order, ETHS Superintendent Eric Witherspoon told The Daily. He also said he hoped the resolution would allow students to continue to feel safe and comfortable talking openly to school officials. According to the resolution, the initiative highlights the school’s commitment to diversity, emphasizing the need to include all students regardless of their immigration status. Minor tweaks were made to the wording of the resolution to clarify its message, but otherwise the resolution passed with its initial provisions. An ETHS student representing undocumented immigrant students brought the matter to the board’s attention last month, member Jonathan Baum said. ETHS will be among the first schools to adopt such a resolution nationwide, Baum said at the meeting. 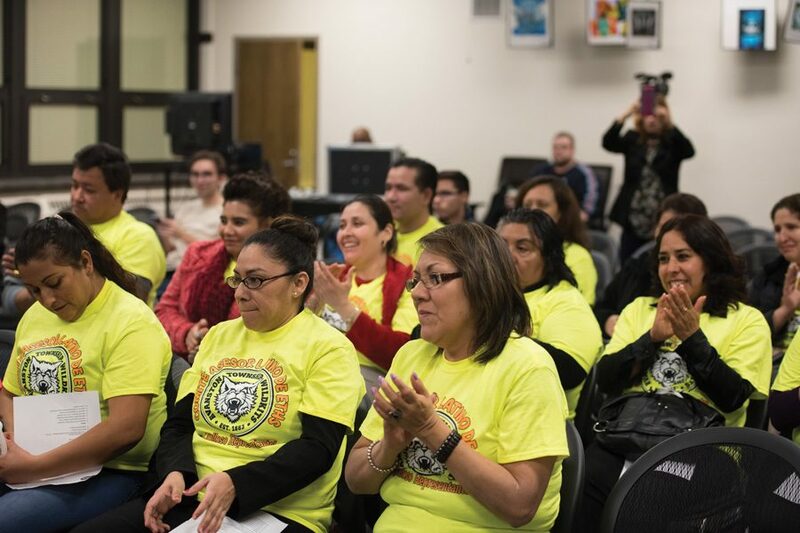 In addition to the board members who attended the meeting, there was a large showing of parent volunteers from the Latino Advisory Committee, donning neon yellow shirts with their last names printed on the back. Mercedes Fernandez, a Latino liaison and minority language coordinator at ETHS, organized the group to show their appreciation toward the board for passing the resolution. She said that the resolution will make the immigrant community feel safer at ETHS. Cities such as Evanston and Chicago have declared themselves sanctuary cities for undocumented immigrants. Evanston aldermen voted to approve a “welcoming city” resolution in December that prohibits any city official from asking a resident’s immigration status unless required by state law or court. Witherspoon said he wants students to feel supported and comfortable. He said ETHS is going to focus on student’s education and well-being, and that immigration issues don’t have a place in the school. “We will take every measure we can possibly legally take to protect every student and their families in this school,” Witherspoon said at the meeting.